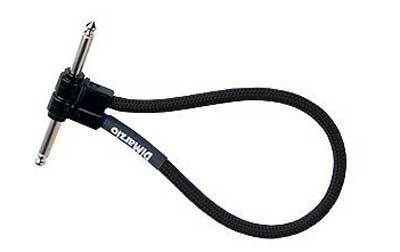 Shop DiMarzio J06 Guitar Instrument Jumper Cable from AMS and enjoy Fast & Free Shipping. DiMarzio is famous for their professional grade guitar cables. Now comes the Dimarzio Jumper Cable. A shorter version of those professional grade guitar cables. Right-angle Switchcraft ends are encapsulated in a super-tough thermoplastic resin that permanently bonds the plug to the cable, making DiMarzio jumpers so rugged and durable that they carry a lifetime warranty. DiMarzio uses the same U.S.-made nylon overbraid cable as in their standard guitar cables, delivering maximum signal transmission and minimum high-frequency loss. I'm a gigging musician who plays every week. This is a good solid cord that is perfect for going between my pedals. In the past I have had problems with these types of cords going bad. This has been a good solid cord with no issues. As always American Musical Delivered the product on time. I would recommend this to anyone looking for a reliable patch cord. I use this plug to connect my wireless guitar system to my pedal board. Perfect size and flexibility. I replace all of my cables with Dimarzio's. 1 - 18' from my amp to pedal board, 1 - 10' from pedal board to guitar and In my pedal board 7 - 6", 1 - 12" and 2 - 36" cables. The difference that the Dimarzio cables made was amazing. A great noise reduction (no buzz) and the sound of my guitar is very clear with very,very little signal loss. The cables are just a little bit stiff, just a little. Great construction, harmonics come through great!